Welcome fellow quilt photographers and bloggers! For those of you who follow me you know that I am a quilter. Did you also know that I am a Journalism Arts graduate? It’s true! I have several photojournalism courses under my belt. At the risk of dating myself I will go on to say that I learned photography back in the days of film! We rolled our film onto reels in complete blackness. Developed our film using chemicals and hung it in a dryer to dry. Then we worked in a darkroom using an enlarger, photo paper and chemical baths to make prints of our photos which were also hung to dry. Totally old school eh?! The good news today though is that you do not need all of that fancy and space consuming equipment. All you need is a good digital camera and a computer! Lacking that you can even get by with a cell phone or an iPod. So with that bit of an intro and background info out of the way let’s get to my top 10 tips! This will give you the highest quality digital photos and if you are shooting photos for print publication it is a must. Not all of us can afford a DSLR so if you can’t get one right away, and you are producing photos for the web, don’t worry. You can still make the best photos you can with a point-and-shoot digital camera or cell phone using these tips. When you are making you photo take an extra couple of moments to look through the lens and look not only at your subject that you are shooting but also look around within the frame of the lens. Is there a lot of extra clutter in the background that you will have to edit out later? Try to edit it out now by zooming in on your subject or physically moving in closer with your camera. Taking a few extra seconds to make a great photo will save a lot of photo editing time on the computer later on. This is a bit of photographer lingo. My photojournalism instructor could not stress enough to us to “bracket your shots.” Bracketing your shots usually means taking a photo at the f-stop (lens aperture) that your camera is telling you to use and then shooting one f-stop up and one f-stop down. Not a lot of us worry about setting f-stops anymore because we usually use our cameras on automatic rather than manual. Before I lose you let me say what I do instead: What I do frequently is instead of putting my camera on manual and fooling around with f-stops and shutter speeds is I just shoot one photo on full automatic. Then I set my camera on two or three of the different automatic settings (such as portrait for example) and take a photo on each setting. Then I check the viewing screen to see what difference that made to the appearance of my photo. At the very least, take more than one photo on more than one setting so you have a few choices once you get back to your computer. Also, be sure to take both horizontal and vertical shots. Natural light is always best for photos. Take your quilt or craft outside if you can or shoot in a bright room that is well lit with natural light. You might think that being out on a bright sunny day is the best for photos but actually an overcast day is often best because it creates the least amount of contrast and shadows in your pictures. If you do need to shoot on a sunny day take your quilt or project to a shady area to take your photos or take your photos in the early morning or in the evening. High noon when the sun is at it’s brightest in the sky is not a good time to take photos. A photo shot in bright light. The colours don’t show up as well as the photo below shot in shade. Also, the background in this photo is not nice to look at. This photo should have been cropped at the time it was taken but if that opportunity is missed it can be cropped on the computer. Photo shot in the shade. Details actually show up better in this photo. This photo was cropped at the time it was taken. A photo taken in bright light. Does it look a little weird? That’s because I tried to adjust the brightness on my computer and now the photo does not look natural. You can’t always fix your photos on the computer using the basic software that comes on the computer so take lots of shots. Another photo taken in the shade of my front porch. The colours almost glow on this photo. There were no filters used to enhance this. I needed to take this photo on that particular day because it was needed for a specific date on a blog hop (the next day!). I was worried that the photo would look washed out because of the stormy day but in fact the stormy skies enhanced the drama of the photo and the colours on the quilt really pop. It was extremely windy so my husband is behind the quilt holding the top two corners and two of my kids are also back there holding a bottom corner each. As I mentioned above shade is a good choice on a bright sunny day but try to make sure that your project is in full shade. Light coming through tree leaves for example can create mottled light on your subject and these bright bits of light will be picked up by your camera and compensated for by it’s automatic settings. This could actually create a darker photo than you wanted. I wanted to shoot this quilt hanging on a barbed wire fence but these trees were created mottled light. So instead I turned around and hung it on the trees and used their shade to my advantage. Another photography term is “flash fill.” This is a technique that you could use to compensate for the darker photo problem mentioned above. Use a flash to fill in the light in the photo. You can use this technique if your subject is back lit as well. Back lit means the primary source of light is behind your subject and this again creates the situation where your subject turns out dark in the photo. If your camera will let you override it’s automatic flash settings then just pop your flash up and use it. Sometimes the camera will not let you override and fire the flash so in that case you can either use the manual settings on your camera or use a hand held flash that you can trigger manually at the same time you press the shutter. You may need a tri-pod so you can hold up the handheld flash and operate both the shutter and the flash trigger button. I used flash fill on this photo and it really made the colours pop. They practically glow! Bouncing light is a photography trick that you can use to manipulate the light in your photos. The simplest way to do this is to make yourself a “bounce card” for your flash. This is for larger flashes on the top of the camera or your handheld flash. This sounds technical but it is the simplest thing. Find a piece of slightly shiny white card such as the card that ladies nylons come wrapped around or cut a piece off of white poster board. Cut this white card the width of your flash and attach it to the top back side of your flash by wrapping the card and flash together with a rubber band. (Do not cover the actual flash with either the card or the rubber band.) The card should extend about two inches past the end of your flash. Have the glossy side of the card closest to your flash. What this does is when your flash fires the light bounces off the card and is directed towards your subject. This is especially useful if your flash is adjustable and can be angled at about a 45 degree angle. When you see fashion photographers on TV using white umbrellas they are also bouncing light with those. I haven’t found myself needing to go buy white umbrellas yet. If you prefer, rather than making a cardboard bounce card you can also buy them in photography shops made of white plastic. All blog photographers need some white poster board and white presentation cardboard like the kind the kids use at science fairs. These create simple inexpensive white backdrops for blog photos that not only put the focus on your subject but they also work to bounce light back to the subject as well. I use white poster board to shoot mini quilts and pincushions from above as well as quilt blocks. You can jazz up your background with little props that match the colours in your subject or leave them plain white. Using white poster board and white fabric as background with props. White fabric background and simple props. White background with no props. This was for a pattern cover so I didn’t want any distractions from the subjects. Poster board background. Quilt block shot from above with props in matching colours. If you want to get your quilt or craft noticed by a lot of people take it out somewhere and get some photos of the quilt with a nice scenic background. Use what you have around you. I live in the country so my quilts have country backgrounds but I have seen quilters living in cities who use graffiti walls to get some really cool shots too. This was shot on a sunny day but in the evening when the sun was lower in the sky. This was shot for a quilt I was listing on Esty. There were other brighter photos used in the listing too but this was such a pretty scene that I included it. This photo would have benefited from using a flash I think but it must have been effective because the quilt sold. 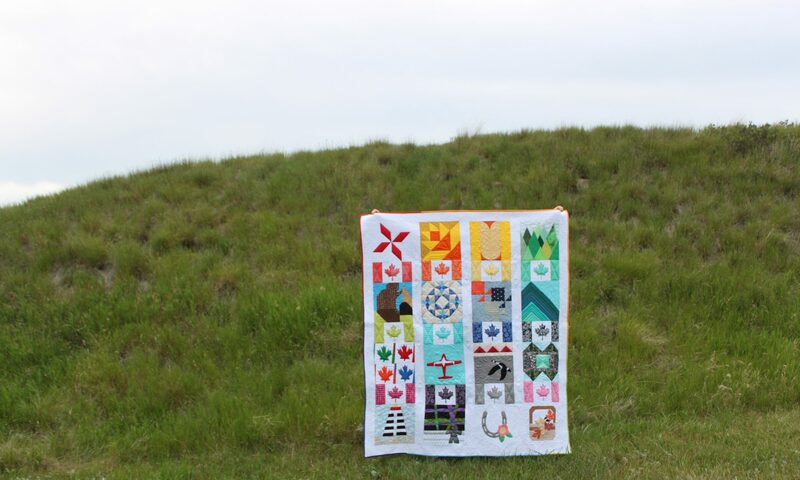 I raced up a hill to get this photo of my 40 Prairie Sunsets quilt at actual sunset. Sometimes you can get the background to match the theme of your quilt if you’re lucky. This quilt has fabrics with little girls playing in a meadow on it. It’s hard to see in the photo but that’s why I wanted a photo by a meadow. This horse was very co-operative in making this photo much more interesting to look at. We all want to see the beauty shot of the whole quilt and that is what draws us in but then we want a closer look. Make sure your blog readers or Instagram followers get a close-up look of your awesome quilting, the cool thread you used or the fun fabric prints. This tells the whole story of your project. Taking this photo in the shade really helped to show the texture of the quilting. This was taken with an iPod so you can get really great shots with that type of camera. The shadows help to bring out the quilting in this photo. Using a flash would have washed the detail out. It’s impossible to see the detail of the quilting on the 40 Prairie Sunsets quilt in the full quilt shot above so a close-up tells more of the story. I hope these tips help you to make great photos! Even if your photos don’t turn out the way you wanted don’t despair. With practice you will get better and you can always edit and fix your photos on the computer. I used a computer filter for the graphic at the top of this post to brighten up the photo a bit. Linking up with Sew Fresh Quilts Let’s Bee Social. Thanks for these. I'm fairly confident about my photography skills but I'm having technical difficulties with uploading photos to my computer and editing them. I was using Picasa successfully for a long time, but it's not working for me anymore and Google no longer supports it. What program do you use? I really need something that lets me resize the photos for use on my blog so it doesn't take too long to upload. Thanks for this helpful post, though I do use most tips already. Brenda, I make all my images with my small point-and-shoot camera or, even more often, with my 5MP phone camera. Then for blog post images I plug them into the computer with their USB cable, transfer the photos to the correct folder. Open them into Microsoft Office and edit. I find colouring the hardest to adjust, so I try to get that right when taking the shots (outside mainly, but sometimes it helps to just shoot from a bit further away, or closer to the window, from a different angle, or with a different background). In Office I adjust by cropping (and other adjustments if needed) and as a last step I reduce the image size to 600-640 px wide. I put them in the posts, which saves them to Picasa, and I set them X-large. For IG I just use the phone camera, and (rotate and) crop in the app. One thing that is no good, is zooming in with the phone camera, or zooming beyond a certain level on the camera. It just reduces the image file size, I may as well do that on the computer where I can see better what I'm doing. Getting closer, or using the optical zoom is better. I have had quite a few compliments on the images in the blog, and use only very basic equipment. Awesome Sandra! Thanks for this comment. Thanks for these tips Anita. Guess I should get busy on my Oh Canada quilt too! Yours is great!! You're welcome Peg! Thanks for visiting today and reading my tips. 🙂 I need to sew another Oh Canada quilt. I have overflowing scrap bins and this is the best scrap buster ever! That Etsy quilt photo is just perfect, the way the greens in the quilt exactly match the green prairie grass. That photo could have been taken yesterday or a 100 years ago. I really like the timeless feel of it. I've been wanting to use white boards for my photos, but my bags are floppy and must be hung up to be photographed. I'm still trying to work out a good solution for that… Your tips are an excellent reference. Thank you! Hi! You're welcome! Right, I didn't think about hanging things. Maybe a removable "Command Hook" on a white wall? Or use a white chair against a white backdrop. Then the chair sort of fades into the background and the bag is what stands out. Very informative post. I learned some new terms also! Thanks! Thank you Nicole! 🙂 I'm so glad you enjoyed it. Previous PostPrevious Are We All Burning Ourselves Out? And if so, for what? Next PostNext 5 Things I Wish I had Known About Pinterest Way Before Now!